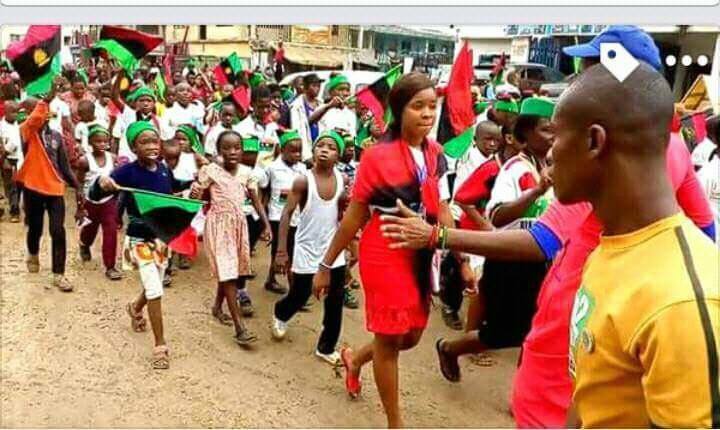 Dozens of kids from Igweocha Biafraland are set to stage a powerful protest tomorrow April 25, 2017 at Federal High Court Abuja where the leader of Indigenous People of Biafra, Nnamdi Kanu will be appearing in court; with the Federal High Court set to rule on bail application filed by the IPOB leader and co-defendants, as well as an application filed against secret trial of the IPOB leader. The coordinator of the adorable children who is also a top official of IPOB zone 2 Umuebulu 2 Etche, Igweocha(Portharcourt) told Family Writers that the kids will be presenting a gift to Nnamdi Kanu, and will also protest against the secret trial of the Biafra leader, even as they have vowed that they will not leave Abuja until Nnamdi Kanu whom they addresses as their 'father' is released to them. 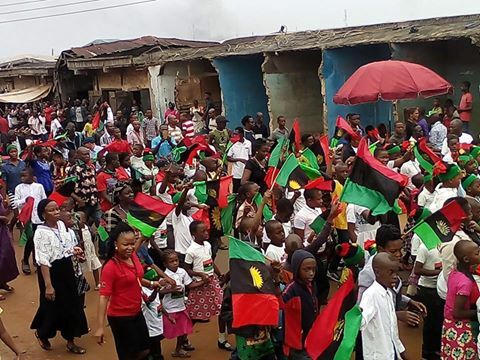 "The children of Biafra are telling the Federal Republic of Nigeria to release their leader and father, Nnamdi Kanu," the coordinator of the 'Futures of Biafraland', Mazi Izuchukwu Agu stated while speaking with Family Writers Press. The leader of Indigenous People of Biafra (IPOB), Nnamdi Kanu has been held in detention since October 14, 2015 when he was arrested by agents of Nigeria secret service known as Department of State Services,DSS. Several court injunctions ordering for Kanu's release have been flagrantly disobeyed by the Nigeria government. Meanwhile, the judge currently handling the case, Mrs. Binta Hajiya Nyako had earlier ruled on December 13, 2016 that the trial of the IPOB leader and three other co-defendants will be classified or done secretly in line with the proposal of the Nigeria government. The defense counsels to Nnamdi Kanu and co-defendants have seriously contested the court ruling, arguing that it is totally unconstitutional and an abuse of the defendants' inalienable right to fair hearing. The Justice Binta Nyako presided Federal High Court will tomorrow rule on whether or not to continue with the secret trial, as well rule on the bail application filed by Nnamdi Kanu and co-defendants(Benjamin Madubugwu, David Nwawusi and Chidiebere Onwudiwe).